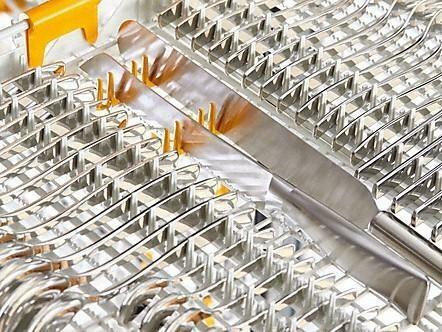 Versatility is key with the intelligent 3D+ cutlery tray. Width, height and depth are variable and can be adjusted to all load situations. Thanks to hinged rows of spikes in the center you have more space for larger cutlery items such as salad servers or cooking knives. 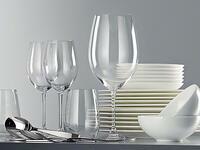 The adjustable side sections even allow you to place long-stemmed glasses in the upper basket. Added versatility for perfect cleaning results. 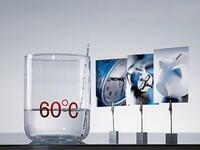 The ambient temperature in the kitchen and the size of the load in the dishwasher can affect the drying process. "In the Sensor wash program, SensorDry ensures optimum drying results even under conditions that are not ideal." 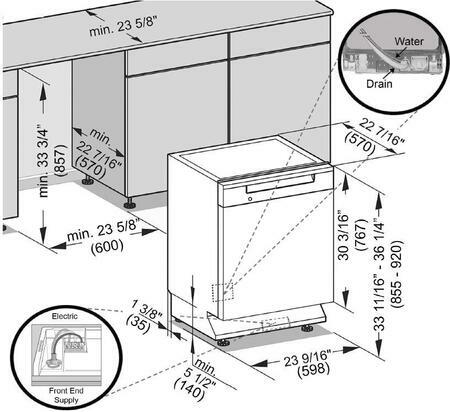 DoubleWaterProof System Miele's "connect and protect" dual-water-proof system automatically shuts off the water supply to the dishwasher In the context of terms and conditions of the water protection system Miele will bear the costs for property damage resulting from any defect of the system or blockage is detected. The 24 hoursour delay start option allows you to operate your dishwasher whenever suits you best and also to take advantage of cheaper (night-time) electricity tarifs. The countdown indicator lets you know how long the selected program has to run. 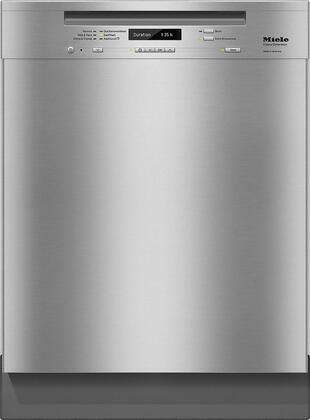 This keeps you informed on the program status of your dishwasher at all times. 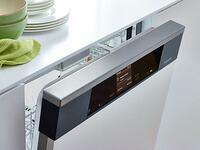 Miele dishwashers now work even more intelligently. "With EcoStart you can protect the environment and make use of time variable tarifs, leaving the selection of the cheapest electricity tarif for the particular running time, to your appliance." 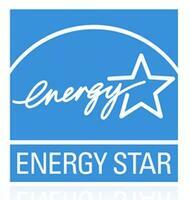 You can program three different tarifs and only have to determine the latest possible finish time. 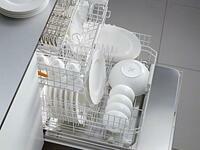 The dishwasher will choose the cheapest starting time within the time window provided. Unmatched synergy: The new dishwasher program QuickIntenseWash and the specially designed UltraTabs Multi achieve the best possible cleaning and drying results for normally soiled dishware in 58 minutes. The specially developed tabs dissolve in only 2-3 minutes. Thus, the cleaning performance begins right at the start of the wash program. 1. Does it have a stainless dishwasher tub material and is it better than Plastic? 2. What are the measurements? 3. How deep is this? 4.How many amps does it use? 5. Does it have Hot Water Connection feature? 6. Does it have cutlery tray? Select models have a 3rd rack or cutlery tray. Please refer to the model comparison for all the models that come with it. 7. What does each program and option do? How much time does it take and what temperature does each cycle operate at? Color identification for user convenience. With the FlexAssist markings you can identify at a glance which elements can be repositioned in order to adjust the basket to your needs. 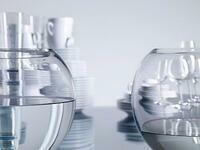 Small symbols, such as a cup or a wine glass on the colored elements point out how the area can be used. 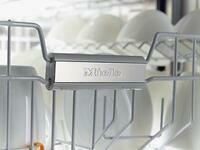 At the same time, the FlexAssist markings serve as handle elements. This allows optimum basket versatility with the flick of a wrist. 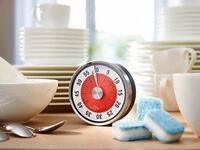 Excellent cleaning performance... Unmatched synergy: The new dishwasher program QuickIntenseWash and the specially designed UltraTabs Multi achieve the best possible cleaning and drying results for normally soiled dishware in 58 minutes. 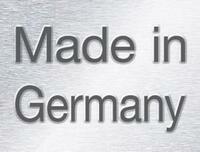 The specially developed tabs dissolve in only 2-3 minutes. Thus, the cleaning performance begins right at the start of the wash program. The result: Cleaning performance class A. The ambient temperature in the kitchen and the size of the load in the dishwasher can affect the drying process. 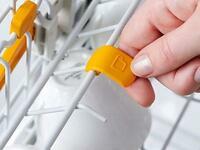 In the Sensor wash program, SensorDry ensures optimum drying results even under conditions that are not ideal. Basket handles, a functionally redesigned lower basket as well as many innovative functions in the upper basket: Miele dishwashers usher in a new era of basket design.